The Golf Team opened their season Saturday with a 9 – 3 point win over New Hampton School at Breakfast Hill Country Club. The weather was sunny and breezy and the teams’ play reflected the spring weather. 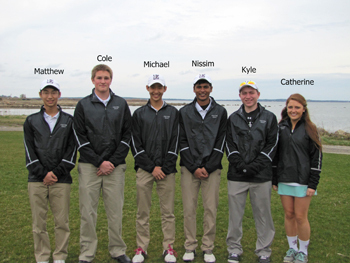 Led by Captains Nissim Ray and Rudy Oku, the team played outstanding golf considering the blustery conditions, winning 3 of 4 of their matches. The Match Medalist was newcomer Kyle Alexander, shooting a solid 41 in the windy conditions. Also participating in the inaugural match was, Catherine Moore, Matthew Kim, Michael Kim, Jack Bright and Cole Gendron. A special thanks to The Breakfast Hill Country Club, our home venue, for hosting our first match of the year. The Golf Team played their 3rd match of the season Saturday with an 8-2 point loss to Deerfield at Crump’in Fox Country Club. The weather was sunny and breezy and the course was soggy. If a coach can ever say that we had a good loss, this is the case in Saturday’s battle. Deerfield is one of the top teams in New England this season, returning all 8 Varsity players to their team. Our two points came from newcomers Michael Kim and Ryan Heavirland. In Michael’s match he closed out his opponent with a birdie on the final hole to win 2 up!! Also participating in the match was Catherine Moore, Matthew Kim, Nissim Ray and Rudy Oku. 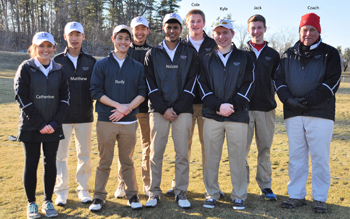 The next match is scheduled against Tilton next Wednesday, April17th at 3:00 at Breakfast Hill Golf Club in Greenland. A special thanks to Crump’in Fox Country Club for hosting our match on opening day at “The Crump”. The Golf Team played their 4th match of the season Wednesday with a 6-6 draw against Tilton School at Breakfast Hill Golf Club. The weather was sunny and breezy and the course was running fast. It was a battle all day with the Ram’s and Big Red throwing great shots at each other all afternoon. The greens proved to be the fastest of the season and might be considered the real winner of the day. Led by Captains Nissim Ray and Rudy Oku, the team played their hearts out. Every match was hard fought and the players never gave up!! Tilton proved to be a worthy opponent. Our points came from newcomer Catherine Moore as well as Cole Gendron and Rudy Oku winning their matches, with Nissim Ray and Kyle Alexander playing to a draw. Also participating in the match was, Matthew Kim, Erin NaPier and Michael Kim. The next match is scheduled against Tabor and Loomis, Saturday, April 20th at 1:30 at the beautiful and challenging “Kittansett Club” on the shores of Buzzards Bay. The Golf Team played their 5th match of the season Saturday with a victory and a loss against Loomis and Tabor at the beautiful Kittansett Golf Club. The weather was sunny and breezy and the course was running fast. It was a battle between Exeter, Tabor and Loomis throwing great shots at each other all day. The greens proved to be the fastest of the season so far. Led by Kyle”The Smile” Alexander - 80 and Matthew “BBQ” Kim - 89, the team played their hearts out. Every match was hard fought and the players played with determination!! We beat Loomis and were defeated by Tabor at their home course. Our scores were from Nissim Ray – 91, Michael Kim – 92, Catherine Moore – 95, Cole Gendron – 96. The next match scheduled is the Andover Invitational, next Saturday at the birthplace of American Golf, Newport CC in Newport RI.